Though the weather is still quite frightful, according to the calendar, spring has sprung! This means it’s time for barbecues and family parties on the patio. It’s time for picnics and birthday parties at the park, too! 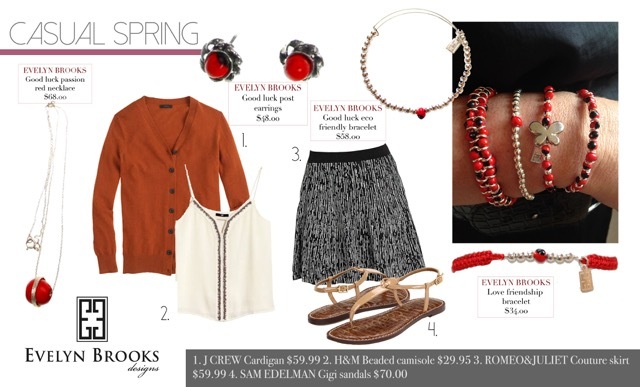 So what do you accessorize with when you swap in your spring wardrobe? EBD, of course! This week’s must haves are Good Luck Passion Necklace, Good Luck Post Earrings, Good Luck Eco-Friendly Bracelet and our Love Friendship Bracelet. Now that we have established accessories, what about an outfit? Well, when you’re hangin’ casually in the warm, springtime weather, we’ve got the perfect outfit for you!